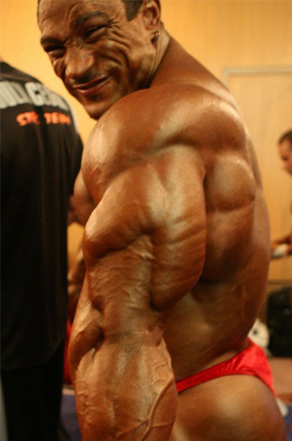 Huge, well developed and defined triceps look incredible. Making up around two-thirds of the upper arm, they really can give your physique that freaky edge. Forgetting the Three Headed Monster! [caption id="attachment_5028" align="alignright" width="532"] Pic: Askmen.com[/caption] The triceps are so called because they are made up of three heads, and it is vitally important that you train all of these heads effectively, if you want to develop full, thick arms. But that’s just common sense. So, what are these three heads, and more importantly, what can you do to ensure they are all hit during your training? 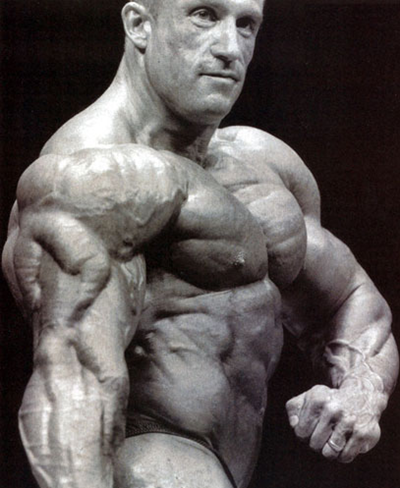 You cannot isolate any tricep head as they more or less work alongside each other. The key to full triceps development is to use a variety of different exercises and grips. The medial head is the deeper of the three heads and provides the basic volume of the muscle. This head is worked most effectively when the arms are by the side, especially with an underhand grip. Underhand cable pushdowns and close grip bench press are the best exercises for the medial head. The lateral head is the one most people think of when they hear the word triceps. It is the head that gives width and that wicked ‘tail’ to your arm. An exercise with a neutral grip, such as rope pushdowns is the most effective way of hitting the lateral head. The long head is the larger ‘tail’ at the back and inside of the arm. This head is hit most effectively by overhead movements such as overhead extensions. Mix it up and you can’t fail to stimulate all three heads into growth. Overtraining is one of the most commonly made mistakes in the gym. Never forget that the triceps, for most of us, are a relatively small muscle group. They don’t need the training volume of larger muscles like quads and pecs. Three or four sets of three or four exercises should be enough to stimulate growth when performed correctly. Utilize the mind-muscle connection to make every rep count and fatigue the triceps as quickly as possible. Adding Sheer Strength Recovery to your post workout nutrition will help to ward off the damaging effects of overtraining. This excellent supplement is packed with everything your muscles need to kick start recovery and growth after a big session. Too many people just concentrate on set after set of pressdowns and extensions. To stimulate huge growth, you need to hit the muscles with big weights. Big weights place more stress on the body and cause the release of anabolic hormones like human growth hormone. Close grip bench press and weighted dips are perfect for hitting the tri’s with a big load. [caption id="attachment_5029" align="alignleft" width="400"] Pic: workouttrends.com[/caption] Using proper form is essential to effective training of any kind. Triceps training is highly susceptible to being performed badly. Never swing weights, don’t use momentum, lift the weight with muscular force. Momentum does not build muscle. Always use a full range of motion. Never skimp on motion just to use a bigger weight. Pushdowns are one of the exercises most often performed ineffectively at the gym. You should keep your upper arms still and by your side, but bend forward slightly to put your body into a stronger position. Press the weight down by moving your forearms only. Feel the triceps do the work, then slowly lower to the start position, feeling the muscles stretch and strain. Proper form will give you huge pumps, improve strength and build muscle. This comes down to proper form again, but it’s an important rule for avoiding injury. Keep the elbows tight and still throughout all triceps exercises to maximise isolation and reduce injury risk to this vulnerable joint complex. Never let the elbows flare wildly on overhead extensions. If you feel that you can’t control it, try different grips and methods until you can. Don’t be one of those people who spend their entire tricep training session in amongst the cables. Similarly, don’t be one of those ‘old school’ people who swear by using free weights only. Both have their advantages, so should be incorporated into your routine. Free weights are great for packing huge tension into the muscle and boosting testosterone levels. Taking Sheer Strength Sheer Alpha Testosterone Booster is a great way to add to this anabolic effect. This super potent supplement is jammed with scientifically proven ingredients that will send your testosterone levels and growth through the roof. Cables also have excellent, muscle building advantages. Some exercises, like kickbacks, are heavily affected by gravity. They are far easier at the bottom of the movement, compared to the top. Cables take this factor out of the equation by providing even tension throughout the movement. Never let anyone tell you that free weights are always better than cables! [caption id="attachment_5030" align="alignleft" width="400"] Pic: muscleandperformance[/caption] Always put a big lift first on tricep day. Sure, warm up with a few light extensions, but your first working lifts should be a big, multi-joint movement one like dips or close grip bench press. These heavy and strenuous sets will set up an anabolic environment and get blood pumping into the entire area. One common mistake is for people to blow out their triceps right before training chest or shoulders. This is an amateur mistake and will lead to ineffective pressing due to the fact that you will have created a weak link.Your triceps will fail first, placing excess strain on them, leading to overtraining, and your chest or shoulder training will be well below par. Even training triceps the day before a big pressing session can wreak havoc on your training. Always plan the order of your training. You should always stop slightly short of lock-out when training triceps. Completely straightening or even hyperextending the elbows leads to huge strain being piled onto the fragile joint and potentially nasty injuries. Stopping just shy of locking your elbows also keeps more strain on the triceps, leading to a more intense and effective set. To increase the effectiveness of your tricep training even further, add Sheer Strength NO2 Nitric Oxide Booster to your supplement stack. This incredible supplement causes the body to release copious amounts of nitric oxide, bringing about some freakish pumps and increased muscular strength and endurance.